Jogging and swimming burn up a lot of calories, but there’s an exercise that people overlook that burns up even more--going up a flight of stairs. An aerobic stepper is a low-tech version of the mini-stepper and stair stepper. 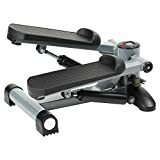 You can get an aerobic stepper that recreates going up flights of stairs, that can give you an good workout in just 30-45 minutes of workout a day. An aerobic stepper can consist of something as simple as a raised platform. But most models allow raising the platform several inches more, adding even shock absorbers and better non-slip traction. And you can add on a whole variety of exercises besides just going upstairs. Simple stepper: These will consist of a platform with solid plastic risers. 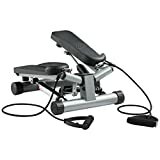 The Movement God 30" Adjustable Workout Aerobic Stepper employs this simple design. Shock absorber riser: These have risers from a springy material, instead of hard plastic. Yes4All Adjustable Aerobic Stepper Platform has risers with a shock-absorbing property. Get to exercise in the privacy of your own home: Some housewives and mothers are pleased with an aerobic stepper, because it allows them to get exercise without having to leave the house. 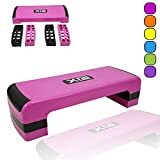 They can easily set aside 30-45 minutes a day to use the stepper for a variety of exercises, without having to prepare to go to a gym or pay membership fees. 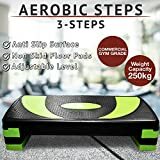 Accompanying DVD: If you want some ideas for alternative exercises, The Step Original Aerobic Platform has an accompanying DVD which can demonstrate what else can be done with a stepper. 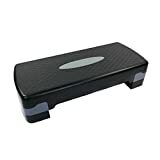 Lightweight and Portable: If you want to carry the stepper along with you, most models of aerobic steppers are around 11 pounds in weight. The Step’s Aerobic Platform is a little more hefty, at 20 pounds. Surface area of platform: Movement God’s platform has a surface area of 30” by 11”. The Step’s platform is somewhat larger, at 40” by 14”. Adjustable Height: The Step aerobic step allows you to adjust the height to 4”, 6” or 8” heights, to make the step more challenging. In some, the adjustable heights are more like shock absorbers--that will make the stepper more durable. The Tenive aerobic stepper can be raised to even 10” height, making it even more challenging. Weight capacity: Take note of the weight capacity when buying a platform. That will tell you what maximal weight the platform can support. Movement God’s aerobic step can support up to 200 pounds, but you can expect a maximal limit in some brands of about 300 pounds. The Muorka Adjustable Aerobic Stepper boasts of a tolerance of 550 pounds! Good traction: You want to make sure that the stepper has good traction, since it might not be safe if it slips on a hardwood floor. Many designs are also made not to scratch hardwood floors. Number of risers: Most aerobic steppers will have 3 risers, each raising the apparatus by 2”. But the Muorka Adjustable Aerobic Stepper has 4 risers, for an extra challenge. The Step--is a maker of aerobic platforms and exercise equipment. They make aerobic steps and stackable risers. Tenive--are makers of exercise equipment and household accessories. 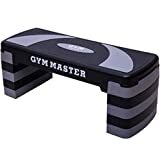 They make exercise mats, undulation ropes, benches, tool boxes, gun safes, dining trolleys, coolers, socket wrenches, aerobic steppers, and more. 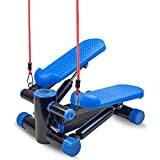 They make aerobic steppers, as well as combination equipment which combines a twisting waist balance rotating board, cardio stepper, and twister disc (for abdominal muscles). Movement God--are makers of exercise equipment for the home and office. 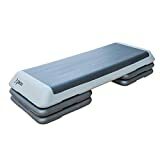 Their 43" exercise stepper can be used both indoors and outdoors. They also make jump ropes, basketball equipment, ab rollers, hand grips, and more. Muorka--makes exercise equipment for a wide range of exercises. They market barbell racks, exercise mats, aerobic steppers, hyperextension benches, and more.